Ryan Pruitt won the 2017 Lions Student Speaker Zone Contest at the Burney Lions Club on Thursday evening February 23. The event was held at the Burney Lions Hall in Burney. Pruitt will now advance to the Regional Contest that will be held on Saturday, March 25 at the Fall River Lions Hall in Fall River Mills. Pruitt won the Burney Club contest on February 9. There are three Lions Clubs in this zone. The two other clubs did not sponsor a student speaker contest, so Pruitt was the only contestant in the zone contest. 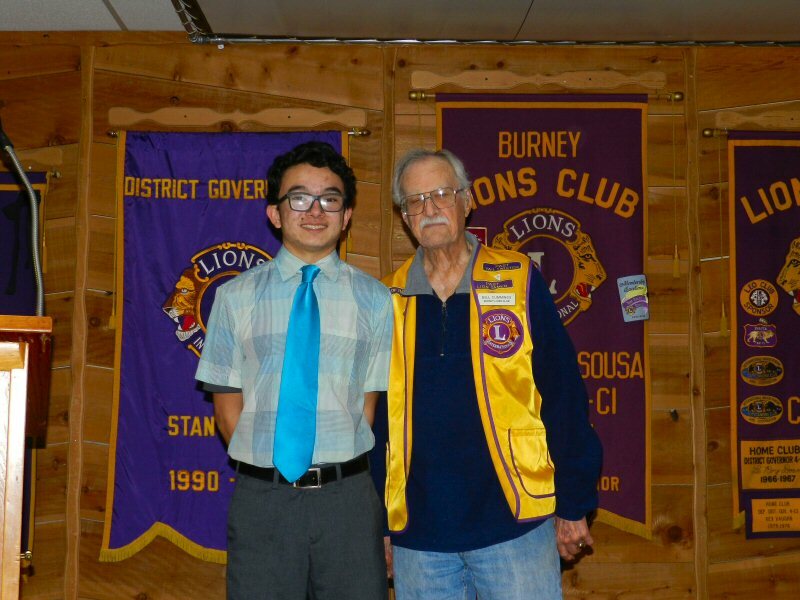 Lion Bill Cummings, who is in charge of the Student Speaker’s Contest for the Burney Lions, explained that even though Pruitt was the only contestant, according to Lions rules he still needed to give his speech and be evaluated by the judges. The three judges were Gary Nunnelley, Alex Colvin, and Jann Hoechlin. Pruitt spoke for ten minutes on this years topic, “Is the right to privacy a threat to national security.” In his speech, Pruitt argued that the right to privacy is a threat to national security. Pruitt used no note cards and his well-crafted speech was accented by hand gestures and well choreographed movement on the stage. After his speech and the tabulation of the judges scores, Pruitt was declared the zone contest winner and presented with a check for $150. Pruitt then introduced his mother Stephanie Pruitt and his speech coach from Burney High School, Melissa Madden. This year, the Lions Fourth District Student Speakers Foundation will provide scholarships totaling $103,500.00. Fifteen District winners will each receive a $4,500.00 scholarship. Four Area winners will each receive an additional $6,500.00 scholarship, and the winner of the Multiple District Four Contest will receive an additional $10,000 scholarship. So If he continues to advance, Pruitt could potentially earn more than $21,000 in scholarships. Winners of the Burney Lions Club Student Speech Contest have a record of performing well at higher levels of competition. Last year’s winner Carissa Tereba won over $11,000 as she advanced to the finals.